Andy Murray is all smiles following a training session on Monday at Wimbledon (Picture: John Walton/PA Wire). Fatherhood could help relieve some of the stress of Andy Murray’s Wimbledon title challenge, according to his mother Judy. This fortnight is the most taxing time of the year for the world No 2 with the extra focus on him and demands on his time. But this year he has an additional incentive to keep his matches short with daughter Sophia, who was born in February, waiting at home for him. Murray’s mother Judy said: “He can switch off when he goes home, it gives him a nice balance in his life. The 56-year-old may be volunteering for babysitting duty to ease her own nerves. Murray first played in the men’s singles in 2005, and Judy has been there through all the highs and lows, but being an experienced hand does not mean she finds it easy. “We’ve been coming here since 2002 when Andy got a wild card into the junior doubles so you know what to expect; the boys (Andy and brother Jamie) know what to expect as well, but the last few years I’ve found it more stressful,” she said. Murray is sharing the limelight this year not just with Jamie, now ranked world No 1 in doubles, but 14 other British singles players ahead of the opening day’s play. It is the most home representatives in a decade, and it is the first time since 1985 that eight players earned entry without the need for a wild card. Many of those players cited Murray’s influence as important in their own rise up the rankings. Judy Murray said: “I think he’s provided a lot of inspiration and belief that it is possible to get to the very top coming from this country, because our track record over many years has been very poor for a grand slam nation. “We should be doing a lot better than we do in terms of number of players in main draws of slams, so it’s great to see so many in the draw this year. 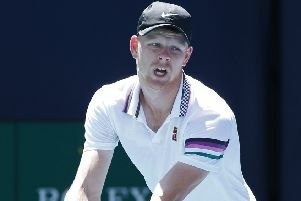 I know that Andy has spent quite a lot of time with [Beverley’s] Kyle Edmund over the last three years and James Ward, a little bit with Dan Evans also.